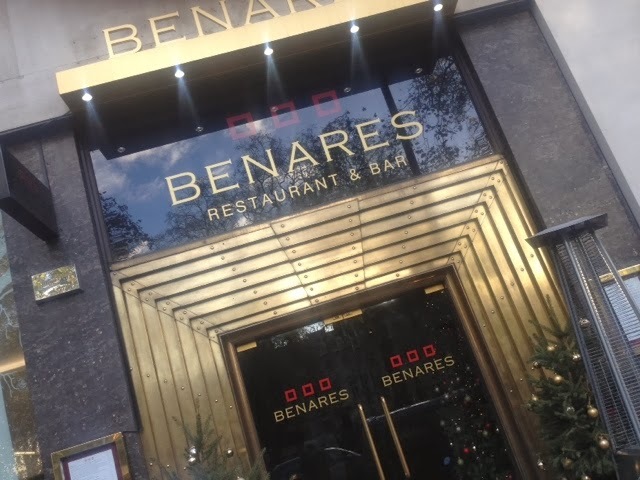 I recently had my first Michelin dining experience at Benares restaurant in Berkeley Square, London. 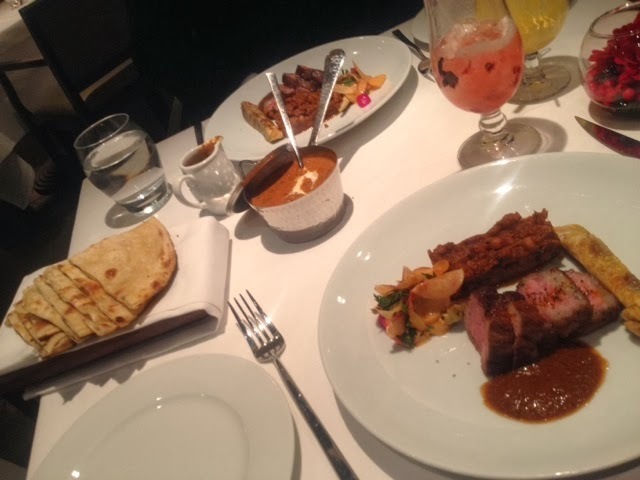 Situated in snazzy Mayfair, Benares restaurant boasts such neighbourhood haunts as the Mayfair Hotel and The Ritz. Benares is one of the few Indian restaurants to have achieved the fabled Michelin star. With Atul Kocher’s menu, Benares provides Indian food with a twist. Think Heston Blumenthal minus the explosives. It was also a huge bonus to find a Michelin starred restaurant which served halal food. If we’d opted for a Gordon Ramsay or other such restaurant, we would have been restricted to the veg or fish dishes. Anyway, my hubby and I tried the five course tasting menu, which offers the highlights of their exclusive cuisine. I initially had misgivings about how filling a tasting menu would be, but by the end I found myself stuffed. 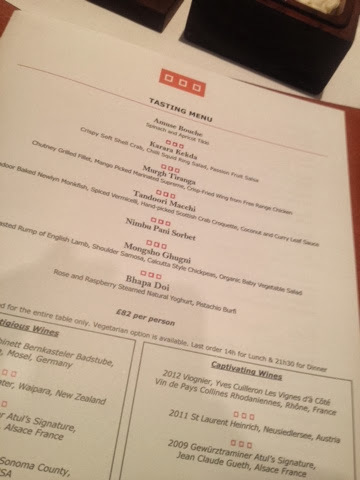 The tasting menu came with the Michelin price – it was £82 a head. But with the mouthwatering experience, you get the unrivalled attentive service to match. 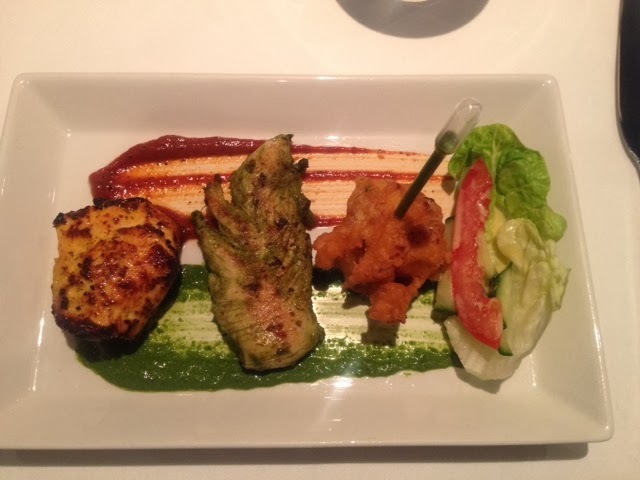 Unlike a standard Indian restaurant, Benares staff really give you the five star treatment. Upon arrival we were talked through every element of the tasting menu. Each course was delivered at just the right pace. We had time to savour each dish, but also weren’t left waiting between mains. 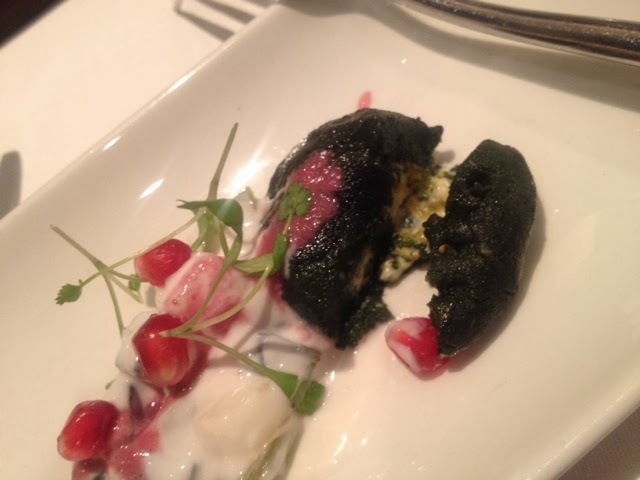 Unlike a traditional Indian restaurant, Benares boasted an explosion of flavours and ingredients that goes beyond standard food fayre. Basil pesto met chutney marinated chicken, soft shell crab met crispy calamari. Everything was desi with a twist. Poppadoms were bite sized, salads consisted of pickled radishes and vermicelli rather than standard lettuce and tomato. Everything was designed to give your palate a new tasting experience. 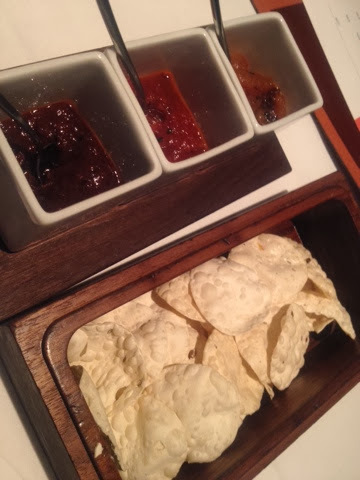 I loved the apricot chutney as I could taste a hint of tamarind. Hubby preferred the pineapple dip. 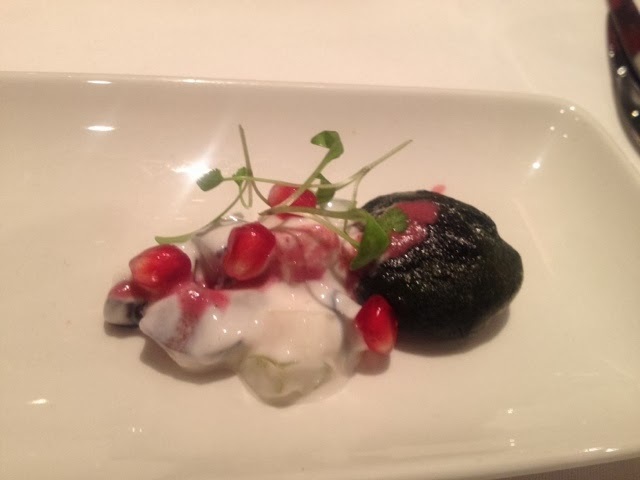 Spinach and apricot tikka with yoghurt and pomegranate sauce. A twist on the standard chicken or aloo tikka, this starter was barely a mouthful, albeit a flavourful one! I did wonder if the rest of the courses would be of the same proportions, but I was relieved that they got bigger and better. My biggest surprise of the whole meal. Soft shell crab with crispy calamari and salad. My last experience of crab, at an English restaurant, was a bit of an ordeal. The crab was head mucus-filled, and cracking the legs filled me with horror as I picked out bits of shell from the crab meat. However no such issues with this dish. 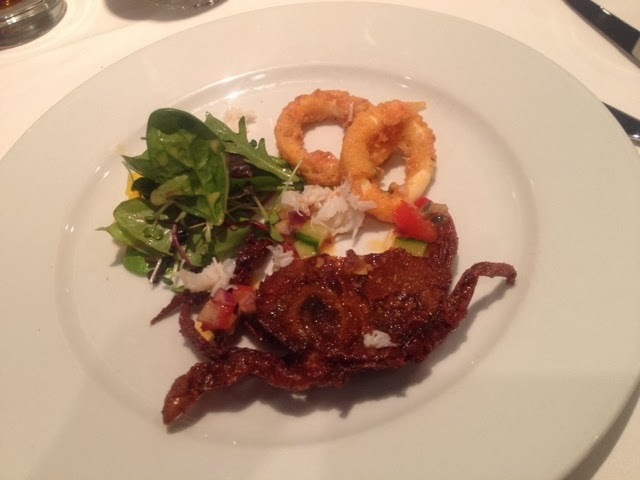 The soft shell crab was wholly edible, even down to claws. So once I got over the fact that it looked like a flattened spider on my plate, the crab was actually delicious with a light and zingy flesh. The deep fry had left the claws crispy, and it tasted a little like an onion bhaji. This was definitely the revelation of the meal for me. Next up was a course of chicken cooked in three ways. One was marinated in chutney, another with some pesto flavour and the final deep fried with a pipette of mint for filling. The chicken was great quality but I found it a bit too meaty in contrast to the lighter dishes. My husband on the other hand, loved it. 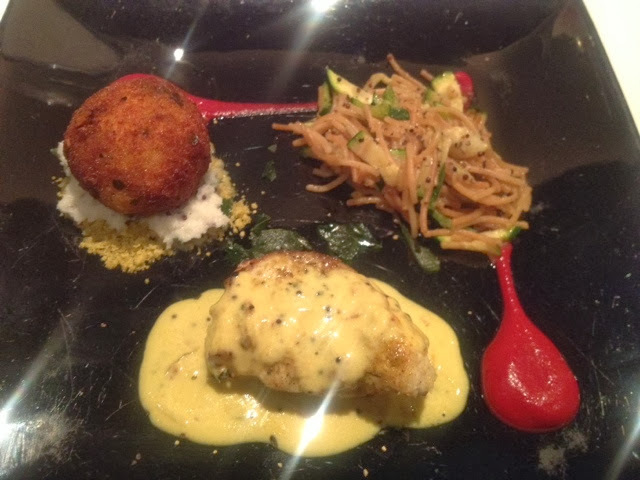 Another surprise- monkfish in a coconut and curry leaf sauce, crab croquette and vermicelli. I loved the monkfish and the coconut sauce was amazing, but found the crab croquette a little too strong on flavour, so slightly overpowering. After the fish taster, we were given some Nimbu paani, which is a zesty sorbet with delicate spices. This was designed to clean the palette before the next course. The paani did the job and provided a fresh interlude before the big finale. 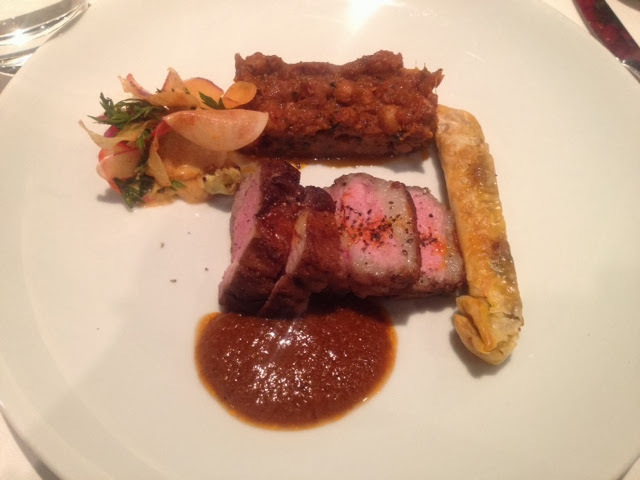 The last savoury dish was a meat medley of rump steak and shoulder meat samosa, with a chickpea side and radish salsa. At this time we were actually surprisingly stuffed, so when they presented this dish with a daal and a side of naan, we were close to throwing the towel in. However, this was the most desi of the course, so would be a shame to miss out. Despite the lavish dish, being loyal to my roots, I actually enjoyed the daal the most. 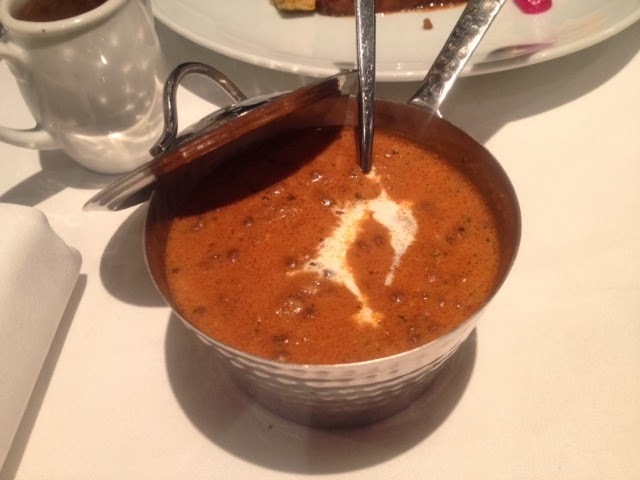 Well stewed and rich in flavour and texture, the daal was just perfect with the naan. The meat was a little to fatty for my liking, but the curried chickpeas were nice. Being a sucker for a salad, I could have had the delicious tangy radishes with every course. To round off our Michelin feast. The dessert was dehydrated raspberries in yoghurt with barfi. The raspberries were amazing with their zingy tangy sweet flavour, the yoghurt was really refreshing, while the barfi was better than any I’d had before from an Indian sweet shop. It tasted like pistachio fudge. The entire affair lasted for three hours, longer than I’d ever spend in a restaurant. However we were kept well entertained and fed with course after course, making it an unforgettable experience. We had a dedicated waiter taking care of our every whim. The only other place where I’d experienced such service was the Mandarin Oriental in Kuala Lumpur, you can read my review of their afternoon tea here. 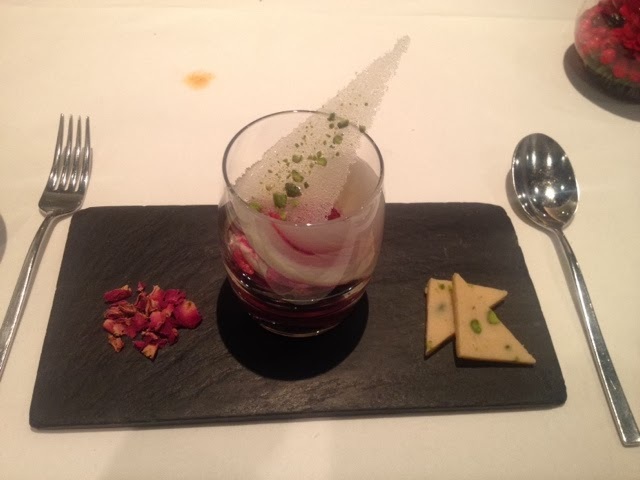 Benares restaurant – worth the money? Of course, the cost puts it out of the equation for standard weekend dining – at least on my budget. However it would make for a great gift or to celebrate a very special occasion. 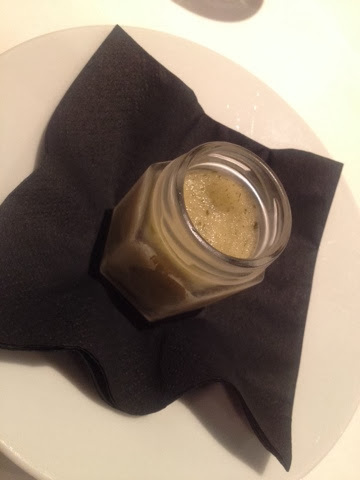 To give some context, considering I spent over £100 for my husband to drive around a race track in an Aston Martin for 50 minutes on his birthday, Benares in probably much more valuable. Also it’s great to have an Indian Michelin starred restaurant, as it flies in the face of a stereotypical curry house. Rather than being much of a muchness, it demonstrates that desi cuisine can provide fine dining, and filling dining too. So my Benares restaurant review is resoundingly positive. It’s well worth a visit.